I found this vase and have no idea how old it is or where it came from. I was told it was in an office some 20 years ago. However that person know nothing more about the vase. 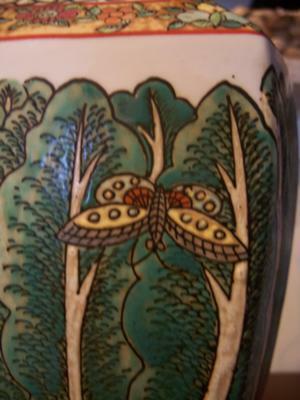 The vase is hexagone in shop and has what looks to be bok choy and butterflies on it. >So is the vase worth anything? >do I need to do anything special to preserve it? I don't think it has any high value. And, you don't need to do anything different from the porcelain we use everyday. If you want to put flowers or anything inside, just go ahead. It should not affect it. Don't use anything strongly abrasive to clean it outside, as it could scratch the enamel. 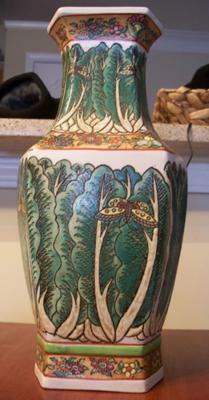 This is a Chinese vase decorated with a "Cabbage Leaf" pattern. 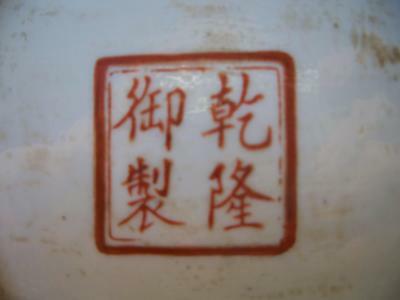 It has a spurious Qianlong mark. This looks like a product of the second half of the 20th century to me. 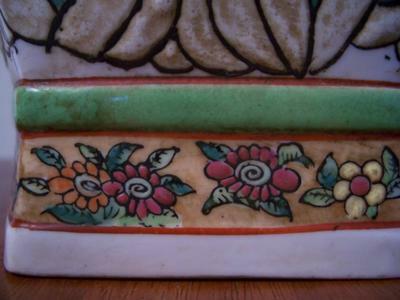 On these pictures the paint work looks relative crude in comparison to antique cabbage leaf vases.